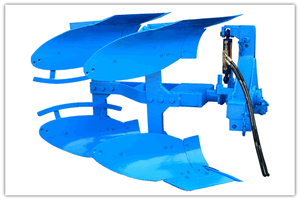 Samyak Agro Industries also has range for agriculture purpose we have developed Reversible Plough. The Two Furrow Reversible Plough is a unique implement, which is directly mounted to the tractor. This is a hydraulically operated basic implement for preparation of land. It is very useful in hard and dry trashy stumpy land condition and in soil where scouring is a problem. Heavy-duty clearance allows the plough to operate under heavy crop residual. This plough works on both the left and right side and automatically reverses the position while ploughing hence less time & diesel consumption. This plough is more suitable for big pieces of land. Two Furrow Reversible Plough handles toughest ploughing job with outstanding penetration performance. The under frame and unit-to-unit clearance are adequate to cope with trashy conditions. Perfect alignment of the plough beams carrying the Mould Board bottom is maintained by virtue of the frame construction. The Mould Board will retain their mirror finish at all time contributing to well turn furrows. The plough has special wear resistant steel bottoms with bar points for toughest ploughing jobs. Bar point bottom ensures longer life as it can be extended or reversed and re-used till the last possible length.